Beneath the 25-mile-long Metrorail that runs through Miami is 25 miles of unused space where grass and a crooked, worn-down asphalt path lay. Meg Daly and Friends of The Underline are trying to turn 10 miles of that unused space into an urban trail that will attract artists, businesses and, perhaps most importantly, get people out of cars and onto bikes. When Daly, the group’s founder and president, broke both of her elbows in a biking accident two years ago, she was forced to start riding the Miami Metrorail to work. She then began to think how a bike path and parks at the Metro stations could be catalysts for making the city safer and more environmentally conscious. Daly believes getting commuters to bike to the metro instead of driving starts with creating a safe biking path to the stations. “We don’t have enough safe trails in Miami; this is the fourth-most dangerous place to walk in the country and it’s the most dangerous place to bike in the state,” Daly said. She explained that the space beneath the Metrorail is 100 feet wide, and they plan on placing two 10-foot wide paths in the space; one for biking and one for pedestrians. The project has already received political and financial support from the cities of Miami, Coral Gables and South Miami, with additional financial support from the Knight Foundation, Miami Foundation and Health Foundation of South Florida. According to Maria I. Nardi, chief of planning for the Miami-Dade County Parks Department, trail benefit estimates that the Underline will reduce 1.4 million motorized trips and decrease 630 tons of carbon dioxide. It is also expected to save 60,000 gallons of fuel and $270 million in pollution control annually. The project will also provide social and economic boosts. In order to attract people to the idea of using transit to get around, the Underline projects hope to turn the bike path into a linear park, with park spaces and space for artistic expression at the stations. “The development of these stations will be developed into an urban environment that integrates and services commuters, residents and workers with destination quality amenities and all modes of transport to connect people to commercial, residential and cultural venues in the county,” Nardi explained. The project was partially inspired by the High Line, which placed a linear park on a disused portion of elevated train tracks in Manhattan. The elevated 1.5-mile-long park now draws more than 5 million visitors annually – more than the Statue of Liberty. The project was designed to bring more green space and development to the area, something that The Underline hopes to replicate. Daly sees the University of Miami community as one that will benefit greatly from the Underline. UM has also taken a role in helping to design the trail and redevelopment of stations. Last spring, students in an architecture class spent the semester designing separate sections of the 10-mile trail. This semester, another class in the School of Architecture is building on the previous class’ work by trying looking at ways to redevelop the University and Brickell metro stations. The 10-mile-long trail would stretch from the Brickell station all the way south to the Dadeland South station, passing through eight stations in total. Once the recipient of a $500,000 design contract is announced, Daly hopes the winning consultant firm can begin construction by 2016. 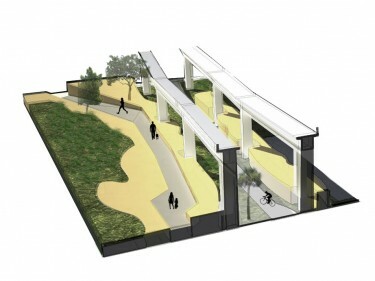 The UM architecture class hopes to engage with the design team selected and share their designs.Beneath the 25-mile long Metrorail that runs through Miami is 25 miles of unused space, where grass and a crooked, worn down asphalt path lay. Meg Daly and The Friends of The Underline are trying to turn 10 miles of that unused space into an urban trail that will attract artists, businesses, and perhaps most importantly, get people out of their cars and onto bikes. When Daly, the group’s founder and president, broke both of her elbows in a biking accident two years ago, she was forced to start riding the Metrorail to work in Miami. It was then that she began to think how a bike path in that space and parks at the Metro stations could be catalysts for making the city safer and more environmentally conscious. Daly believes that getting commuters to bike, rather than drive, to the metro stations starts with creating a safe biking path to the stations. “We don’t have enough safe trails in Miami; this is the fourth most dangerous place to walk in the country and it’s the most dangerous place to bike in the state,” Daly said. The project has already received political and financial support from the cities of Miami, Coral Gables, and South Miami, with additional financial support from the Knight Foundation, Miami Foundation, and Health Foundation of South Florida. According to Maria I. Nardi, Chief of Planning for the Miami-Dade County Parks Department, trail benefit estimates that The Underline will reduce 1.4 million motorized trips, decrease 630 tons of carbon dioxide, save 60,000 gallons of fuel and $270 million in pollution control annually. Beyond environmental benefits, the project will also provide social and economic boosts. In order to attract people to the idea of using transit to get around, The Underline projects hopes to turn the bike path into a linear park, with park spaces and space for artistic expression at the stations. “The development of these stations will be developed into an urban environment that integrates and services commuters, residents, workers with destination quality amenities and all modes of transport to connect people to commercial, residential and cultural venues in the County,” Nardi explained. The project was partially inspired by the High Line, which placed a linear park on a disused portion of elevated train tracks in Manhattan. The elevated 1.5-mile long park now draws more than 5 million visitors annually- more than the Statue of Liberty. The project was designed to bring more green space and development to the area, something that The Underline hopes to replicate. The 10-mile long trail would stretch from the Brickell station all the way south to the Dadeland South station, passing through eight stations in total. With the recipient of a $500,000 design contract to be announced on Feb. 2, Daly hopes they can begin construction by 2016. The UM architecture class hopes to engage with the design team selected and share their designs.